This Mimi Pack 8 oz Tin Can Shallow Round Solid Top Lid For Salves, Favors, Spices, Balms, Candles, Gifts 24 Pack Rose Gold are perfect for a variety of uses. These tin cans are formed from high quality steen tin plate. Multi-functional and strong, these tin cans are built to last. These tin cans are durable and convenient for every single day of your life. You can be sure that these are not made of cheap material. You can use them to store your petite makeup tools such as lip gloss, creams and balms. Use them as one of your memorabilias in you wedding. In addition, you can also use them as a main tool for your kitchen spice racks. If you are fond of travelling, you can use these tins to keep candy and mints which are the protection for travel sickness. You can also use them to store your tea bags. For extra safety, you can also use these tins for your homemade candles. These unique tin cans can't be found anywhere else! Have a unique, special keepsake! Check out our entire line of tins! We have different sizes and color available! 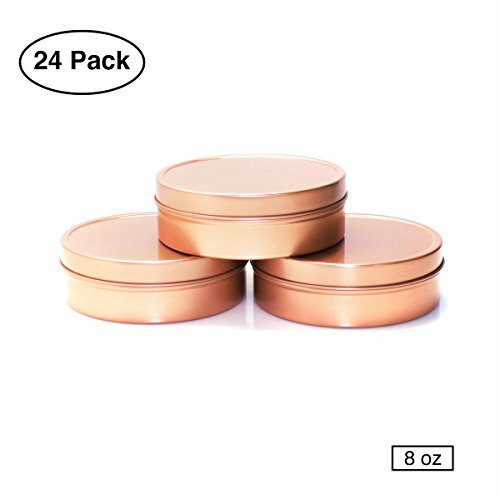 HIGH QUALITY - Mimi Pack 8 oz Tin Can Shallow Round Solid Top Lid For Salves, Favors, Spices, Balms, Candles, Gifts 24 Pack Rose Gold are made from premium steel tin plates. These high quality tins are made to be strong and durable for you to use the tins in longer terms. MULTIUSE - These tin cans are durable and reusable. Use them again over and over for your makeup, gels, powders, creams, balms, or hair wax. They go as a great addition to any jars you might have. MULTIPURPOSE - Our tins are perfect for your kitchen spice racks. Or use them as a beautiful container for gifts or to stash your jewelry. These tins can also be used for your homemade candles! Use them to store your tea bags, herbs, or different mints and candy. Lightweight and great for travel or as a lovely favor keepsake for your wedding or next party event. These are great for spice tins and at bulk pricing! FULL DIMENSIONS - Diameter measures 4 inches. Height is 1-3/16 inches. Seamlessly formed base and lid. 100% MONEY-BACK GUARANTEE - Craft Clouds are backed by 100% guarantee that you are fully satisfied with your product or receive your money back.